In addition to carpet, hardwood and tile floors have been gaining in popularity. Ceramic tiles and hardwood floors are just a few types of hard surfaces now in demand. While tile floors are easier to keep clean than carpet, these too eventually need professional attention. The most common tool used by the homeowner is the mop. This appears to do an effective job for a period of time, but eventually dirt and grime are absorbed into the grout between the tiles and buildup causes the tiles to appear dull and dingy. Absolute Carpet Care’s exclusive steaming process removes dirt and bacteria from both the tile and grout leaving it looking brand new. We then use a professional grade Bridgepoint sealer on the grout to ensure maximum protection. Absolute Carpet Care is your answer to grease or soil buildup in kitchens, sunrooms and more. Soap scum in bathrooms and pool rooms are no problem with our exclusive process. Absolute Carpet Care deep cleans many types of tile surfaces. We also offer a protective sealant for tile and grout to protect your surfaces from permanent staining. 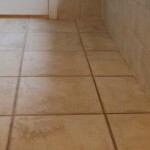 There is something to be said for the beauty of spotless tile floors with clean grout lines. It creates such a fresh clean atmosphere. Absolute Carpet Care’s Turbo Clean system can make almost any tile look and feel like new! Find your worst area, and an Absolute Carpet Care representative will come out and clean an area to show you what clean really is (destroying dirt, grease, and bacteria for an amazingly clean floor). Most people think mopping does an adequate job, but the grout sits lower than the tile, causing the dirt and grease to accumulate creating the perfect environment for bacteria to live and breed. Absolute Carpet Care’s has years of experience not only removing dirt, grease, and bacteria, but also sealing the grout to protect your floors between cleanings. Trust in Absolute Carpet Care to give your establishment the look it needs and deserves.